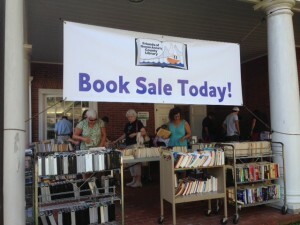 RAMS HEAD SHORE HOUSE is proud to support the FRIENDS OF QUEEN ANNE’S COUNTY LIBRARY with a generous GIVE BACK NIGHT. 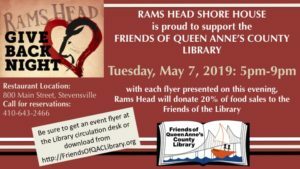 On Tuesday, May 7, 2019, from 5pm-9pm, Rams Head Shore House will donate 20% of its food sales to the Friends of the Library, for all tables presenting a Give Back flyer, which can be downloaded here. 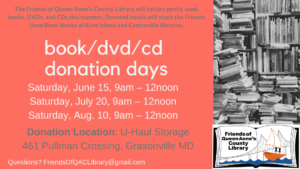 While the Friends of the Library accept donations of gently used books, CDs, and DVDs throughout the year at Kent Island and Centreville libraries, a lack of storage space limits the amount of donations we can generally manage. During the summer, though, the Friends are able to accept donations of large collections of books at an offsite storage facility. Just pull your car up to the U-Haul Storage center on one of our three Book Donation Days, and load all of your books onto a cart to be taken away! While the Friends of the Library accept donations of gently used books, CDs, and DVDs throughout the year at Kent Island and Centreville libraries, a lack of storage space limits the amount of donations we can generally manage. During summer, though, the Friends are able to accept donations of large collections of books at an offsite storage facility. Just pull your car up to the U-Haul Storage center on one of our three Book Donation Days, and load all of your books onto a cart to be taken away!